Bedford River Valley Park is a place with a long history, from Ice Age mammoths to Goldington Power Station. Click here to watch a 2 1/2 minute animation that zooms through Bedford River Valley Park’s history, from mammoths to matchsticks. Much of this past is now hidden from view, such as Neolithic mortuary enclosures and Romano-British farms, while some historic features survive, like a platform of Willington railway station. The landscape was formed by streams from melting glaciers which dumped massive amounts of gravel and sand. After the last Ice Age, bands of hunter-gatherers moved into the newly wooded land where red deer grazed. Over the next millennia, generation after generation lived, farmed, worshipped and buried their dead here. In more recent times the River Ouse was used to transport cargo and a railway line connected Bedford and Cambridge. During the 20th century, nearby Goldington Power Station kept the lights on in Bedford and the gravel was quarried for road aggregate. Bedford Borough Council and the Marston Vale Trust have received a Heritage Lottery Fund grant totalling £79,800 to tell the story of this past. Much of our knowledge comes from archaeologists and local historians. For more information about the Heritage Lottery Fund then please visit www.hlf.org.uk. Archaeologists excavated sites dating from prehistory, the Roman period and the Middle Ages in advance of quarrying and other development. In 2014 and 2015 we will install interpretation boards at key points, create a geocache trail, fix QR code waymarkers, produce a temporary exhibition and add heritage pages to this website. 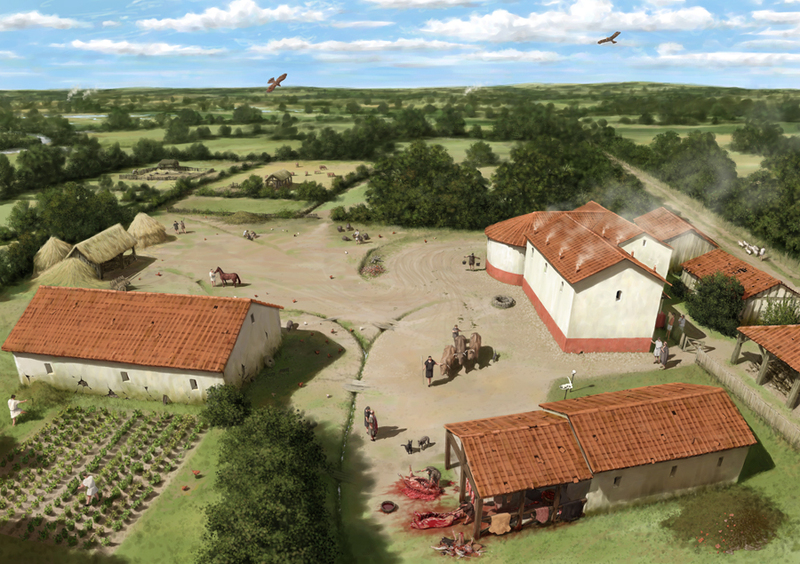 Key periods in time will be brought alive as reconstruction drawings such as this one of a high status Romano-British farm. Priory Marina now occupies the site of this farm. Listen to archaeologist Jeremy Oetgen talk about what makes the park’s archaeological landscape special. Newnham Romano-British Farm. Illustration by Pete Urmston.